Incredibly, Drucker first made this statement to a management conference in 1957! And yet, 50 years on, the notion that present and future decision making are separated in time still dominates management thinking; the former focusing on current operations and the latter on the visions, strategies and plans intended to realise the desired future. So how do Drucker’s insights on the time dimension of decision making and the need to focus on the present play into current thinking about the dynamics of organizations? "The question …is not what we should do tomorrow. It is: what do we have to do today [my emphasis] to be ready for an uncertain tomorrow? The question is not what will happen in the future. It is: what futurity do we have to factor into our present thinking and doing, what time-spans do we have to consider, and how do we converge them into a simultaneous decision in the present?" So Drucker’s idea of decision making as a “time machine” recognises that future outcomes are wholly products of the complex interplay of decisions made by people in the present. Also that it is not only those decisions that are 'headlined' as strategic decisions that have potentially strategic implications for the organization. The view of organizations as complex responsive processes, put forward by Ralph Stacey and his colleagues at the University of Hertfordshire, takes this further still. It challenges the taken-for-granted, common-sense notion that time is linear; that it flows from the matter-of-fact past, through the transient present, towards a future that is waiting to be unfolded. Instead they focus on what they call “the living present”. “The past is not factually given because it is reconstructed in the present as the basis for action to be taken in the present. The past is what we re-member. The future is also in the present in the form of anticipation and expectation. It too forms the basis of action in the present. Furthermore, what we are anticipating affects what we remember and what we remember affects what we expect, in a circular fashion. In this way, the movement of the living present is experience, having a circular time structure that arises simply because humans have the capacity for knowing what they are doing.” (Taken from page 206 onwards). I’ve tried to illustrate this in the diagram below. 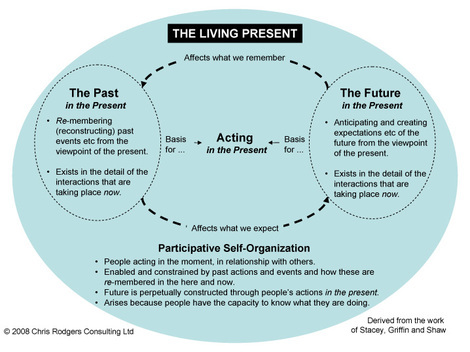 In the notion of the living present, then, “… the future, as expectation and anticipation, is in the detail of actual interactions taking place now, as is the past as reconstructions in this process of memory.” (Again from Griffin, The Emergence of Leadership, p 185). So what can we take from these insights into the nature of decision making and action taking in organizations? Drucker, then, calls on managers to pay attention to those decisions – theirs and others’ – that are taking place through interactions in the present. “… all managers are active participants with each other in the interactive processes that are the organisation. … The emphasis shifts from the manager focusing on how to make a choice [in and about the future] to focusing on the quality of participation in self-organising conversations from which such choices and the responses to them emerge [in the living present].” (Stacey, Strategic Management and Organisational Dynamics, 5Ed., 2007, p 444). So both Drucker (long-range planning) and Stacey (strategic management), five decades apart, underscore the importance of managers paying attention to, and engaging in, what’s happening in the present. Informal Coalitions similarly argues that outcomes emerge from those everyday conversations and interactions that take place continuously throughout the organization. The ways in which people perceive, interpret, evaluate and act upon their perceptions of what’s going on, and the interplay of these with all of the other decisions and actions taken elsewhere, determine the results that are achieved. This sense-making and action-taking process will go on with or without managers’ active involvement. The only real choice that managers have, therefore, is whether or not to engage with this process in a deliberate way; with the aim, in Stacey’s terms, of improving the quality of their participation. Other references to Drucker and Stacey on the site can be found by using the Google search box. *NOTE: All of the quotations by Peter Drucker are taken from Chapter 8 of the book, entitled Long-range Planning. This begins on page 120 of my copy; but this is an edition published by Pan in 1970, so the pages of the current version might be different!